Even I didn’t remember how long ago I started working on this story until I started going through the box where I had stored its entire history on paper. Oh, the trees I have killed. For you tree-huggers out there, I want you to know, I recycle paper. I save printed pages and use the backs to print out drafts. After they’ve been printed on both sides, they go into the recycling bin for county pick-up. Once I’ve recouped my investment in getting Not Quite Heaven up for sale, I promise I will plant a tree in its honor. One of the first things I discovered was a list of queries I sent out in 1999 and 2000 as well as manuscript pages dated January 27, 1999 and later. I found critiques, oh my goodness, the many, many critiques from fellow authors and my then critique group. I want to thank everyone who ever took a look at these pages and gave me feedback, including: Tina, Sandy, Paula, Marlene, Susan, Judy, Joyce and Lynn. More recently, Cathy and Tara. A four-page synopsis entitled “Love Fix” dated August 4, 1997! Ian’s name was originally Mark. Ian almost dozed off slumped in a chair, feet propped on the edge of his bed. The bed he’d be sound asleep in right now if it weren’t for Melissa Ballantine. When a ragged gasp tore from her throat Ian’s feet hit the floor. He peered at her in the dim light. Her eyes remained closed, but perhaps she had regained consciousness. “Yes,” she whispered. Her eyelids fluttered but did not open. He refrained from laughing out loud at her question. She’d find out soon enough where she was and who she was with. “Not quite heaven, no,” he affirmed. I found notes on my original idea dated July 15, 1996 along with character sketches dated February 2, 1997. Newspaper articles, one on hitting a moose from October 22, 1996 and one on Canadian timberwolves dated December 22, 1996. Makes me think I should start reading the local newspaper again. This manuscript received Honorable Mention in the Undiscovered Writer I Contest in 1999 and placed second in the Silicon Valley Gotcha contest the same year. All of the above may explain why writers have a hard time answering the question, “How long does it take to write a book?” A story is like a child you love. You never give up on it. 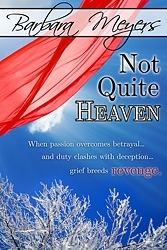 A version of Not Quite Heaven was turned down by an editor in 2008. There was lot she liked about it which made me think after some more work it might soon be ready for public viewing. It’s now available. May you love reading it as much as I enjoyed writing it. barbara meyers, history, not quite heaven, romance novels, writers. Bookmark.